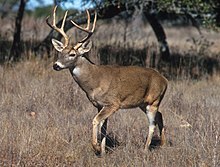 A deer is a ruminant. A ruminant is a mammal that eats and digests plant-based food such as grass. Ruminating mammals include cattle, goats, sheep, giraffes, bison, yaks, water buffalo, deer, camels, alpacas, llamas, wildebeest, antelope, pronghorn, and nilgai. The word "ruminant" comes from the Latin word ruminare which means "to chew over again". Rumination works by chewing and swallowing in the normal way to begin with, and then regurgitating the semi-digested cud to re-chew it and so get the most food value out of it. Rumination makes the half-digested food particles smaller, before they can go through the process of digestion. The primary difference between a ruminant and non-ruminants (such as people, dogs, and pigs) is that ruminants have a four-compartment stomach. The four parts of the stomach are the rumen, reticulum, omasum, and abomasum. In the first two chambers, the rumen and the reticulum, the food is mixed with saliva and separates into layers of solid and liquid material. Solids clump together to form the cud or bolus. The cud is then regurgitated (brought up to the mouth) and chewed slowly. Fiber, especially cellulose, is broken down by microbes (bacteria, archaea, protozoa, and fungi). Even though the rumen and reticulum have different names, they are the same functional space, as the digesta (food material) can move back and forth between them. The digesta then passes into the next chamber, the omasum, where water and many of the mineral elements are absorbed into the blood stream. After this the digesta is moved to the true stomach, the abomasum. Digestion takes place here. The digesta is finally moved into the small intestine, where nutrients are absorbed. Water is absorbed in the large intestine, leaving the waste. Almost all the glucose produced by breaking down the cellulose is used by microbes in the rumen, and so ruminants usually absorb little glucose from the small intestine. Rather, ruminants' requirement for glucose (for brain function and lactation if appropriate) is made by the liver. There are 3.5 billion domestic ruminants, with about 95% being cattle, goats and sheep. There are also about 75 million wild ruminants. They can be found anywhere except for the continents Australia and Antarctica. Most of them are in Europe, Africa and Asia. This page was last changed on 21 June 2016, at 15:57.